Flashing relay with fixed rythm - 2 CO contacts - 5 A.
Pluggable on socket with a withdrawal clasp and square guide pins which can act as a key to ensure that the correct relay is used at the correct voltage (see our withdrawal guide inthe technical support pages of this site). Pluggable on the following sockets : EVB2/CA, ERC2/CA and ERDL2/CA. * flashing frequency : 60 to 120 beats per minute at nominal voltage (possible decrease of the frequency by connecting an external capacitor between terminals +14 and -15).
" " 100 W-0,8 A 6 " "
" " 150 W-1,2 A 4 " "
220 " 75 W-0.34 A 8 " "
" " 200 W-0,9 A 2 " "
. 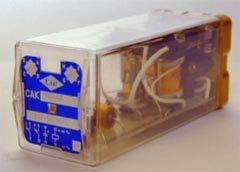 CAK relay with high contacts rating.